When you are hosting a party, it is important to find ways to entertain your guests. This way, you can make sure that no one gets bored or does not have a good time. 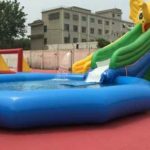 If you are hosting an outdoor party during the hot months of summer, finding a way to keep everyone cool can be difficult. 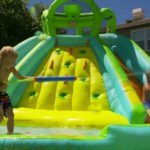 A great way to entertain your guests and help them beat the heat is by renting an inflatable water slide. While you might think that these are aimed at kids, they are actually a lot of fun for people of all ages. 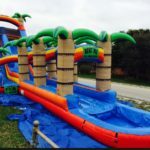 Setting up such a slide at your party will make you the talk of the town. However, before you go ahead and get things started, there are a few important precautions to keep in mind. After all, you do not want anyone to get hurt at your party. Keeping these safety tips in mind will help everyone enjoy themselves without any fear of injury. Be sure not to set the slide up on too much of a slope. 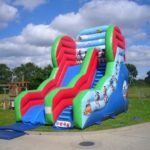 While you need a bit of a slope so that people will be able to slide easily, too much of a hill means that people may be going too fast by the time they reach the bottom of the slide. 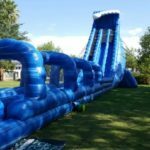 A gentle slope is usually plenty to get people going quickly enough that they have fun, but not so fast that they end up careening off the end of the slide. Be sure to keep the slide wet at all times. 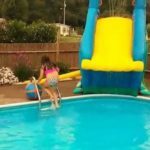 Sliding down a dry plastic slide while only wearing a swimsuit is not a lot of fun. 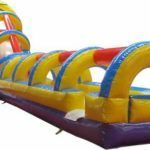 You need to ensure that the slide stays wet enough that people are able to slide comfortably without getting hurt. Have someone watch the slide at all times to make sure that everyone is using it safely. Having a monitor on hand is important so that people do not take risks or do things that could be dangerous. Before anyone goes on the slide, it is important to make sure that they know how to do so safely so that they can just have fun. 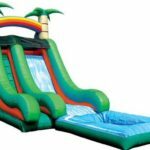 An inflatable water slide is a great addition to any outdoor party for adults. Just keep these safety tips in mind so that everyone can have a lot of fun on a warm summer day.